Not all states are equal when it comes to renewable energy policy -- particularly when it comes to how well states accommodate corporate clean energy procurements, according to a new report by the Retail Industry Leaders Association and the Information Technology Industry Council. The commercial and industrial renewable energy market currently totals around 5 gigawatts of contracted wind and solar power, with these large-scale customers planning to procure an additional 60 gigawatts by 2025, according to the Renewable Energy Buyers Alliance (REBA). Whether or not companies will be able to meet their procurement goals relies heavily on state-level policies, which some leading corporations are actively trying to make more favorable. The Corporate Clean Energy Index ranks all 50 states based on the ease with which companies can procure renewable energy for their operations. The methodology balances the needs of corporate customers with larger and smaller loads to reflect the diversity of Retail Industry Leaders Association (RILA) and Information Technology Industry Council (ITI) members. While geared toward retail and technology companies, the report also reflects the interests of other energy purchasers, including those in the military, healthcare and higher education. The index consists of 15 indicators broken down across three categories -- utility purchasing options, third-party purchasing options and onsite/direct purchasing options. The results were also combined for an overall ranking. Furthermore, all calculations were adjusted by dividing megawatts of deployed renewable capacity by the state’s total installed capacity in order to create a level playing field. Taking this approach, Iowa, Illinois, New Jersey, California and Texas claimed the top five positions for clean energy procurement overall -- each for a unique set of reasons. Iowa leads the overall index ranking primarily because of the opportunity to procure renewable energy (RE) through regulated utilities within the state. “Iowa’s strong corporate RE deployment levels show that even in a regulated state, a utility strongly committed to RE, in this case MidAmerican Energy, can create large RE procurement deals as it has with Google and Facebook,” the report states. The 548 megawatts of wind power capacity deployed by MidAmerican on behalf of Google and Facebook represents 3.32 percent of Iowa’s total generating capacity. Illinois ranked second on the index because of its leadership in the direct renewables procurement category and for its attractive third-party purchasing options. 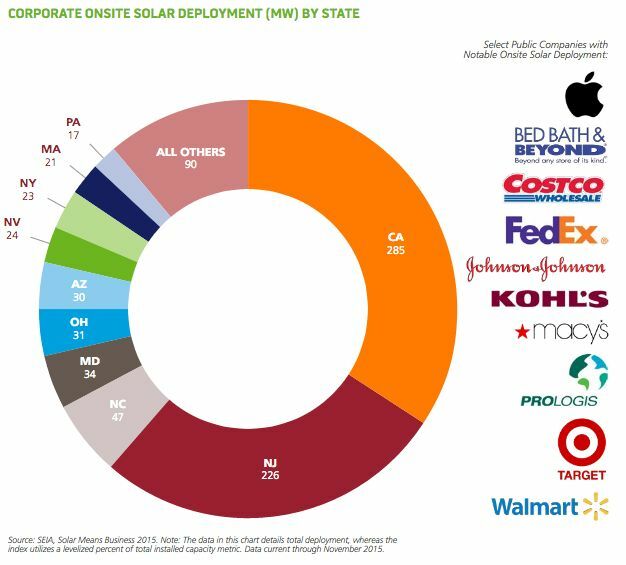 New Jersey ranked high for its onsite solar purchasing options, Texas for its offsite PPAs, and California for both. Working with a utility, like Google and Facebook have done in Iowa, has the potential to be less complex than a renewable energy deal struck with a third party. It may also be the only option available to a corporate renewable energy buyer in a regulated electricity market. These utility deals can take the form of a green tariff program or a direct utility purchase. While only a handful of these deals have been done to date, they represent an enormous opportunity to reach untapped renewable energy markets. Iowa, the overall index winner, also topped the list for utility renewable energy purchasing options. Nevada and Virginia rounded out the top three spots on the utility purchasing options list -- although Nevada’s Green Energy Rider has been the subject of some controversy. With both red and blue states topping the leaderboard, the corporate clean energy procurement index demonstrates that favorable renewable energy policies are not linked to political leanings. 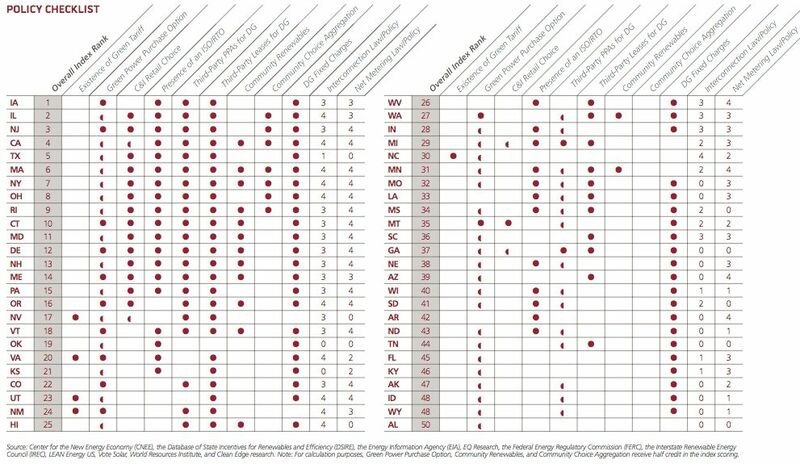 The list of best states for third-party renewable energy arrangements looks quite different from the list ranking utility purchasing options. In this category, states are ranked based on the ease of completing an offsite wind or solar PPA, which is mostly limited to deregulated states. 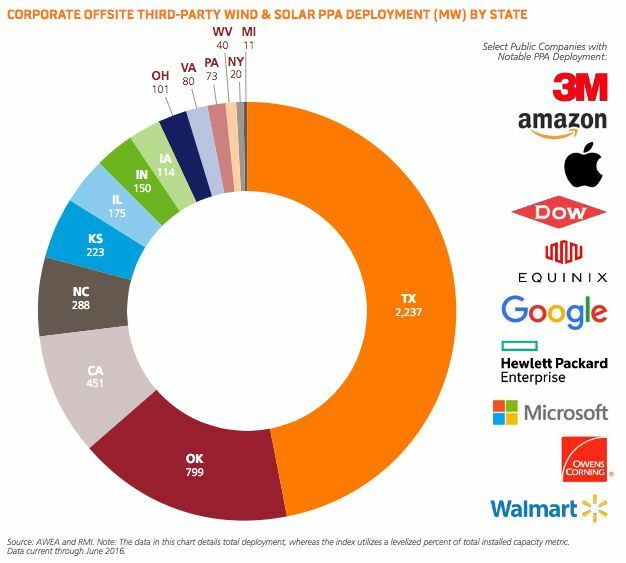 A number of other corporate renewable energy deal structures -- third-party onsite PPAs, third-party leases, community renewable energy programs and community choice aggregation -- were also factored into this category. In this ranking, Texas, Oklahoma, California, New York and Massachusetts make up the top five states, with Texas dominating in total megawatt deployments of offsite PPAs. A third category of corporate RE procurements identified in the RILA/ITI report is for onsite and direct projects. This category has the most overlap with the overall ranking, with 16 of the overall top 20 states also on the top 20 onsite/direct list. Illinois, New Jersey, California, Massachusetts and Ohio hold the top five spots in this category. There is actually very little onsite solar and wind in Illinois, according to the report. However, the state has a significant amount of direct investment, described as "large offsite projects within the state that are directly owned by a corporate customer rather than leased or providing power through a PPA with the developer or utility." Illinois is one of just three states to have done a direct investment deal. At the end of 2015, Illinois had 98 megawatts of direct investment, all via one agreement with Ikea. This market structure helped put Illinois at the top of the onsite/direct category. While direct deals were coupled with onsite renewable energy in the report, this really seems to be two different stories. New Jersey ranked second in the category by leading the index for corporate onsite solar by a wide margin, with corporate onsite solar accounting for 225.6 megawatts, or 1.21 percent of the state’s total generation capacity. That puts New Jersey well ahead of California on a weighted basis, with onsite renewables accounting for 285 megawatts, but just 0.38 percent of generation capacity in the Golden State. In addition to ranking all 50 states for their corporate renewables purchasing policies, the RILA/ITI report identifies barriers that prevent states from growing their economies through domestic renewable energy. Actions states can take to improve their standing include facilitating third-party agreements, adopting green tariffs so that more corporate buyers can work with their utilities and removing additional barriers for offsite and onsite corporate renewable energy projects, like taxes and interconnection fees. The report notes there is no "one-size-fits-all" solution. Rather, there are several different actions states can take that would go a long way toward supporting the growth of corporate renewables procurement and helping businesses thrive. In many states, this process is just beginning. 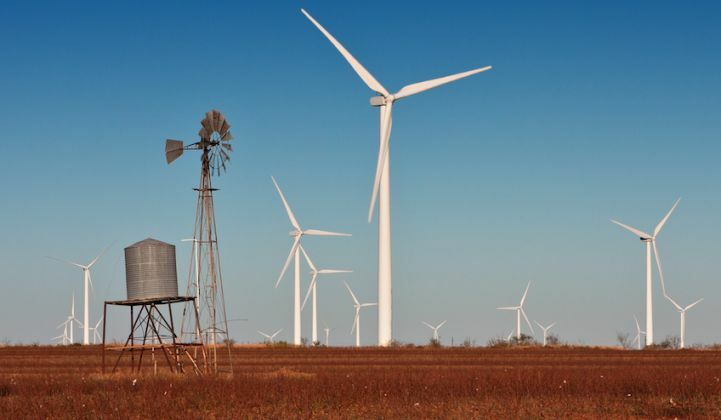 "We are encouraged that a number of states have made significant efforts to support [renewable energy procurement],” said Mark Vanderhelm, vice president of energy at Wal-Mart, in a statement. “Much work remains to be done, and we look to these efforts to determine the best practices that will drive the broader creation of cost-effective, customer-focused and operationally sustainable renewable energy procurement programs."